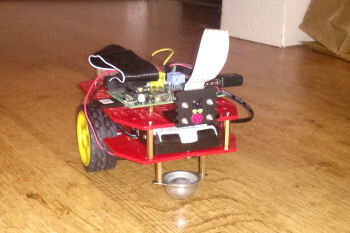 A Raspberry Jam is activity to help teach programming to children. It's based around the low cost Raspberry Pi computer and is lots of fun as well as educational. I've been hoping to attend a Raspberry Jam for a while, but this is the first I've been able to attend. The Coventry Raspberry Jam was held as part of PyCon UK. The Jam was held in a separate part of the Technology Centre campus, but the link up with the Python conference meant that a number of python developers came over to help the children with programming. I originally signed up both my 5 year old son and 8 year old daughter, although in the end I only took my daughter. I think this worked well as whilst there were other young children there that did have a good time, I think my son would have found it a little boring. The Jam was hosted by Alan O’Donohoe already well known from several other Raspberry Jams around the country. The Jam started with some Lightening talks. These were two minute talks by some of the children and adults attending. 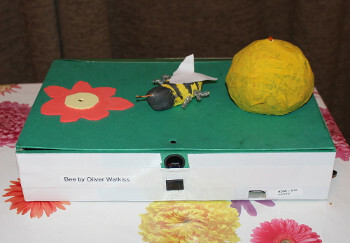 My daughter gave a brief introduction to the Raspberry Pi Bee Project that we made earlier this year. I also gave a demonstration of my Robot vehicle. My daughter named it Ruby Robot. This is a simple robot based on the Magician Chassis, a low cost easy to build robot. It's configured as a WiFi hotspot with a Python program that can be controlled from any Wireless computer. I'll be providing full step-by-step instructions in future, but I only just got it working a few days before the Jam and I am looking to write it up thoroughly. Most of the day was spent as a Dojo / hack session. The children split into groups of three and there was a mix of children programming in Scratch or using the python API to control Minecraft. I've been teaching my daughter Scratch at home and through Code Club, so I suggested to my daughter that she had a go with Minecraft. Although I've heard of Minecraft I'd not actually played in before. There was a getting started guide provided which helped to get us going with the Minecraft API and we joined with a boy that was already a big Minecraft fan. We were also helped by Michael Foord (one of the Python Core Developers), so getting an opportunity to learn with a real expert. For my daughter it was about learning some new skills and inspiration for future programming. It also gave me some ideas for things we can do together. Some of the other children were able to create some good programs including some games and a fish tank animation. All the children were enthusiastic about the Raspberry Pi and .seamed to enjoy the day. During lunchtime I got Ruby Robot out and let the children have a go at controlling it using an Android Tablet. It was one of a few different robots that people had taken to the Jam which seams a great way to get children excited about technology and engineering. There were also some other demos of other things that people had brought along. There was even a demo of a quad-copter, although unfortunately some technical issues meant it didn't perform in the way it was intended. The event was supported by the Bank of America who helped fund the event and CPC who provided equipment on loan for the event. As a result the event fee was quite reasonable at £5 per child (parents went free with a child), which included a personalised mug, T-shirt, mini-torch and lunch. 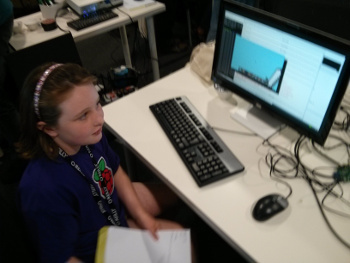 If you have children aged about 8 and upwards then I'd certainly recommend taking them along to a local Raspberry Jam to find out what they think. Even if they don't like "ICT" (which is about using rather than programming a computer) there is a good chance they will enjoy the programming or interacting with Minecraft. The girls enjoying themselves just as much as the boys, showing that programming and having fun doesn't have any gender boundaries. Find about a Raspberry Jam near you.